What an incredible honor to have ~Barack Obama~ in SF last night, on Presidents’ Day! He dined at ~INTERNATIONAL SMOKE~, and chef Michael Mina cooked for him—of course ~Ayesha Curry~ and ~Steph Curry~ were there, alongside ~Chrissy Teigen~ and ~John Legend~ as well. Obama is in town for MBK Rising!, an invite-only, two-day convening in Oakland that is part of his My Brother’s Keeper Alliance (“MBK Alliance leads a national call to action to build safe and supportive communities for boys and young men of color where they feel valued and have clear paths to opportunity”). Both Curry and Legend are part of the conference, which will be streamed live for the next two days. On Saturday August 4th, the whole Curry clan, including ~Stephen Curry~ and ~Ayesha Curry~’s new baby, Canon Curry, visited ~WATERBAR~ and dined on oysters, squid, caviar, fish ‘n’ chips, and kid’s ravioli. Steph and Ayesha also enjoyed the restaurant’s Lawn Party cocktail. Cheers. Last night, Mr. ~Stephen Curry~ and Mrs. ~Ayesha Curry~ celebrated their sixth anniversary at ~SPRUCE~! Happy Anniversary, you gorgeous couple. Play It Again, Steph and Ayesha Curry! It’s not every night you’re enjoying dinner and a show at the ~BLACK CAT~ and then suddenly ~Stephen Curry~ is playing the tambourine onstage and ~Ayesha Curry~ is noodling around on the keys. It ends up the couple came in for dinner after checking out Hamilton, and enjoyed oysters, meatballs, kale salad, and saffron chicken. No word if they are going on the road with the band. Last week’s opening of International Smoke at Mina Test Kitchen was obviously star-studded, since the project is a collaboration with ~Ayesha Curry~. Also in the house: ~Stephen Curry~ and ~Drake~! There’s a fun pic on chef Adam Sobel’s Instagram here. Good luck getting a seat at this pop-up! By Dana Eastland. Nothing was the same for roasted chicken last week, apparently, because none other than hip-hop artist ~Drake~ was spotted at Zuni Café on Wednesday night. He was in the company of five bodyguards, natch. 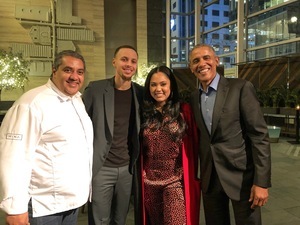 Then, on Thursday night, the Canadian partook of a highly American activity: postgame burgers with Golden State Warrior ~Stephen Curry~ and his lovely wife, ~Ayesha Curry~. Specifically, the trio proved what a time it is to be alive at the Alameda In-N-Out, where the boys ordered double-doubles animal style and Ayesha got her burger protein style. They were accompanied by a crew of 15, including bodyguards and friends, and Drake reportedly took over the intercom—perhaps to open his very own hotline burger? SFist has the full story on the burger date.